affordable to make, health-friendly, and totally eco fab. In a study published in the journal Archives of Environmental Contamination and Toxicology, this ultraviolet-absorbing compound in sunscreen was found to have toxic effects on young coral that causes endocrine disruption, DNA damage to the coral, and even coral death, among other the problems. Oxybenzone also heightens coral bleaching, a process in which coral lose their color and reject symbiotic organisms. 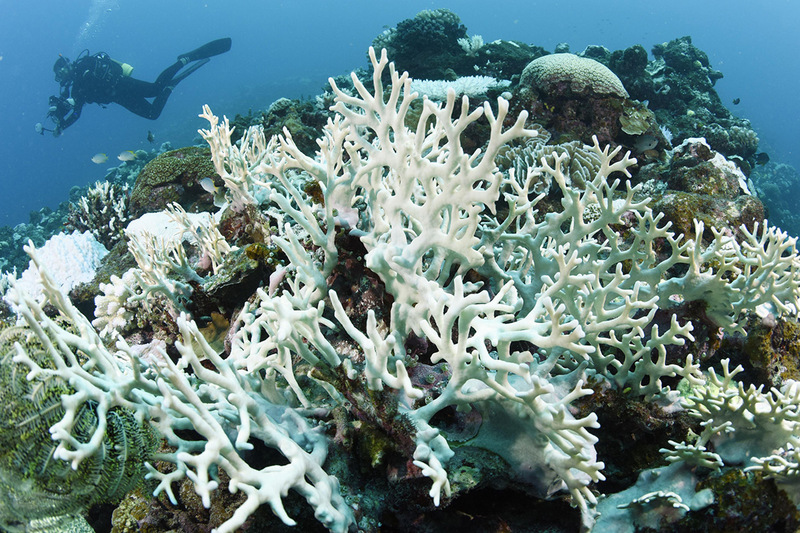 Bleaching has been particularly present in recent years due to rising sea temperatures. According to the U.S. National Park Service, somewhere between 4,000 and 6,000 tons of sunscreen enters coral reef areas around the world each year. That’s a shockingly high amount of sunscreen considering how little it takes to cause toxic effects. Toxicity occurs at a concentration of 62 parts per trillion, according to a new study. Just to give you an idea of what this looks like, author and researcher at Tel Aviv University Omri Bronsteinthat, claims this is like a drop of water in an Olympic swimming pool. Beyond the impressive appearance of coral reefs, they play an important role in local communities and the world at large. Firstly, they contribute to local economies through sustaining ecosystems where people can fish. Additionally, coral reefs foster tourism. An estimate released by the National Oceanic and Atmospheric Administration put the economic contribution of coral reefs around the world at $30 billion each year. Perhaps most importantly, coral reefs protect the global environment by serving as carbon sinks, where they absorb carbon dioxide and alleviate climate change. What is toxic to the planet can't be too great for us either, right? Right. Many sunscreens contain toxic ingredients or endocrine disrupting chemicals that in many cases can actually promote skin cancer growth and free radical production in the body. In a study conducted by the Center of Disease Control, 97 percent of Americans are contaminated with a widely-used sunscreen ingredient called oxybenzone that has been linked to hormone disruption, cell damage, and allergies. Additionally, the Environmental Working Group found that sunlight causes oxybenzone to form free radical chemicals that may be linked to cell damage. Oxybenzone is also linked to low birth weights in baby girls whose mothers were exposed to it during pregnancy. Another active ingredient in sunscreen, octionoxate, has been linked to acne, contact dermatitis, and rashes from allergic reactions. Over the past fifty years, 80 to 90 percent of fragrance ingredients have been synthesized from petroleum and some of the commonly found harmful chemicals in fragranced products include acetone, phenol, toluene, benzyl acetate, and limonene. Shockingly, a small 800 of the approximately 4,000 chemicals used as fragrances have been tested for toxicity, either in combination with other chemicals or alone. These chemicals are so harmful to our health that the U.S. National Academy of Sciences has grouped fragrances with heavy metals, insecticides, and solvents in the same categories of chemicals that need neurotoxicity testing. Not just a few but all of these toxins cause central nervous system damage. Wait a second... How is that okay? A conscious consumer may question. Well, to answer bluntly, it's NOT. Yes, there is hope and there is always hope in any situation-- you just have to find it. Find below an ecofriendly, health-friendly totally badass sunscreen recipe. Note that many articles on the internet will tell you that homemade sunscreens are harmful and that a person should never consider making their own sunscreen because it is difficult to verify the SPF, making the chance of burning is higher. It is true that homemade sunscreens don’t have the lab testing that conventional ones do; however, even with lab testing, conventional brands get away with putting endocrine disruptors and coral killing compounds in our sunscreens. In any case, proceed with caution and cover up the old fashion way with clothing first. When you do want to be out in the sun, use your homemade sunscreen or a conscious brand (see my top 7 recommendations below!) that you've heavily researched. Lastly, talk to a knowledgeable naturopath to figure out what amount of SPF is needed for you. Everyone is different, so what will work for a person with darker complexion will likely not work for a person with lighter complexion. *Affiliate links above & below. If you make a purchase through these links, I will receive a small commission. This is at no extra cost to you. Pour your bulk lotion into your blender or food processor. I bought my lotion in bulk at Earthwell Refill in North Park. I used the Bulgarian Lavender Body Lotion by Griffin Remedy which I researched heavily and LOVE their clean ingredients. Slowly add in your zinc oxide powder. Do not breath the powder in. Make sure you use non-nano zinc oxide powder, as this will not absorb into the skin. Blend your sunscreen until smooth and zinc oxide particles look evenly mixed and dispersed into the lotion. Notice the zinc oxide powder will thicken your lotion. Add in your cacao powder to give your sunscreen color. Depending on what complexion you have, add more cacao to get a darker sunscreen and less to get a lighter sunscreen. Move your sunscreen into a 4 oz container. Gently apply to your skin & go have some fun in the sun! *All of my recommendations below are cruelty free and zero waste friendly sunscreens. Happy summer my loves! See you soon. *This blog post contains many references to an original article that I wrote for One Green Planet. To view it, click here.